This post is presented compliments of Lorimer Wilson, editor of www.munKNEE.com (Your Key to Making Money! ), www.FinancialArticleSummariesToday.com (A site for sore eyes and inquisitive minds) and the FREE Intelligence Report newsletter (see sample here – register here). The post may have been edited ([ ]), abridged (…) and/or reformatted (some sub-titles and bold/italics emphases) for the sake of clarity and brevity to ensure a fast and easy read. You can also “Follow the munKNEE” daily posts via Twitter or Facebook. Please note that this paragraph must be included in any article re-posting to avoid copyright infringement. At this point, it is mostly in Europe, where the banks have about four times the assets of the US banks and are in about 10 times the trouble. There is some consensus on a price tag for all this trouble….about $30 trillion, all of which is unpayable, other than with printing press money, or things which are similar but amount to the same thing…. 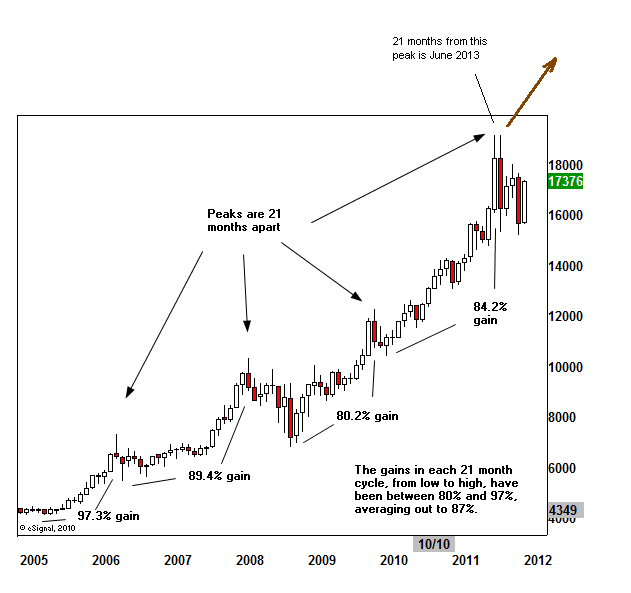 The last peak was last August, and 21 months from then puts us at June, 2013. A sharp run-up in gold into next June is implied. [In the above chart] we see that the twin parabola fractal has formed and we are well on our way into the second parabola. Note the percentages on this chart. 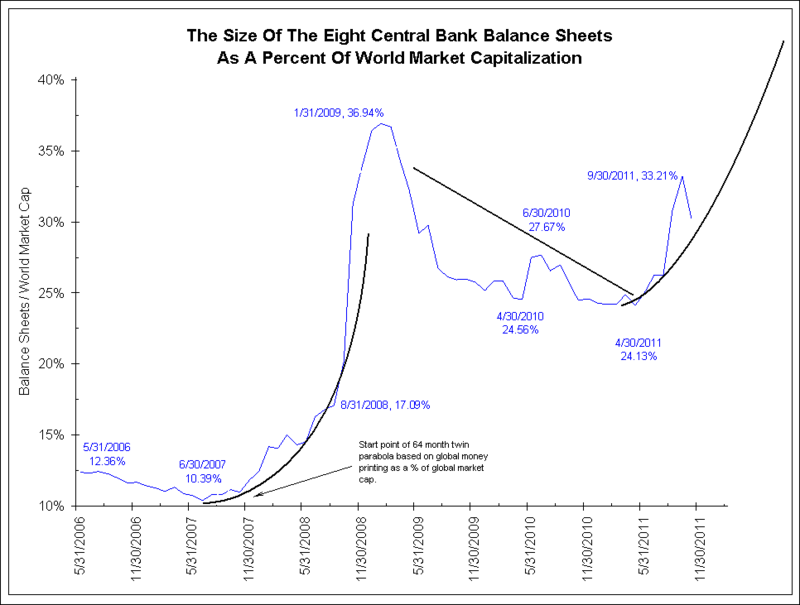 It is absurd to have over a third – approaching half of the world’s ‘free’ market capitalization – be central planning/central bank interference. Their intentions were good but, then, so were the Soviet Union’s 5 year plans. Those that fear deflation fear owning gold but, to me, the whole inflation/deflation gold debate is a moot point. I think J.P. Morgan had it right when he issued his axiom “Gold is money. Everything else is credit”. Think about it. Besides gold, the only other types of money are currency and credit. Currency is just an IOU from a government that can change how much they owe you with the flip of a printing press switch. In the Depression of the 30s, there was no inflation of the currency, it was the credit world that was messed up, and gold was grabbed up by the government (at a sharply marked up price) and gold miners skyrocketed while the rest of the stock market languished. In the ’70s, we had no credit collapse, but the currency, unhinged from gold in ’71, was eaten alive with inflation, and gold went through another massive bull market. It is really the monetary instability that gold reacts to, whatever its form. 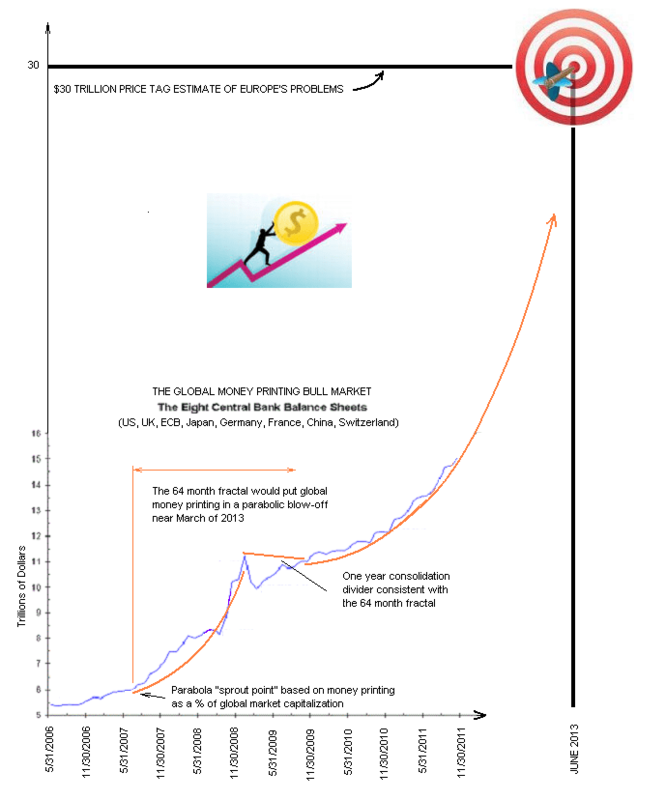 In our present mess, one wonders if they will over-print or under-print to manage the debt write-off damage to the money supply in the economy but does it really matter to the gold bull market? 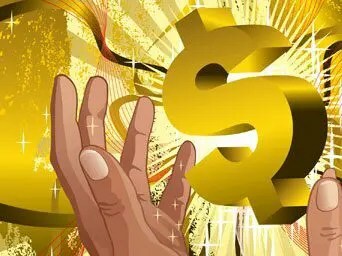 Whether it’s the currency or the credit that gets whacked, the third form of money is going to benefit. Gold is money. Everything else is credit. If you really want something that looks like a complicated, bond based, hedged-in-all-directions investment vehicle but with returns more like that of a risk asset, look at the gold royalty stocks. There are just two big, well diversified names here, Royal Gold (RGLD) and Franco-Nevada (FNV). If you look at a performance comparison chart of RGLD alongside GLD, the gold price ETF, or AGQ, the 2X silver price ETF, or the S&P 500, or any of the gold stock ETFs over the past few years, you see a smooth, big outperformance of RGLD over all of these alternatives. You can’t see much evidence of any big Dow crashes or gold stock crashes for that matter in the chart for RGLD. This investment has nearly tripled the past 5 years and is currently near its all time high despite the gold stock malaise. FNV is very similar but has actually outperformed RGLD and is at a new all time high. What is so different about these investments? They are essentially a finance company that provides capital to miners in exchange for an agreed upon percent of their future gold sales. This one simple concept accomplishes a boatload of defenses against market uncertainties. For one thing, it takes individual gold miner risk out of the equation. Why do they vastly outperform any gold stock index? Well, they strike these deals based on a price of gold at the time and subtract some cash cost for production at the time. Then the miner uses the capital given to them to develop production over the years while both the price of gold and the cost of production go up. By the time the percent of production comes rolling in, RGLD is making a production profit that is in another ball park from the miners. Buying RGLD has been compared to buying a call option on gold with no expiration date. It’s also like a twenty year gold futures contract. The income statement for the company is marked by a net profit margin that can run around 40% with the biggest single expense being income tax! Gold could drop dramatically and RGLD would be profitable. As of early 2010, most of the deals for Royal Gold’s mines were struck at a $480-$780 gold price. The gold royalty model is perfect for credit problems and deflation. In the 2008 crunch, miners who derived much of their revenue from base metals associated with their mines found both their product prices plummeting and their capital credit impaired. Royal Gold was able to strike lucrative deals with these hurting miners. Both RGLD and FNV aren’t hurt by deflationary base metal problems as so many miners are who must extract many metals together for their business model. The gold royalty companies can zero in on just deeply discounted gold. These companies are ideal for investor angst over inflation/deflation periods and that’s probably what we will have for many years if no global debt solution is found – and we will have a compressed, even more dangerous period, if a global debt jubilee is attempted. 2. von Greyetz: Gold Going to $3,500-$5,000 in 12-18 Months – and $10,000 Within 3 Years! 3. The “80-20 Rule” Suggests Gold Will Reach $8,300/ozt in Spring of 2015! 4. Update: 51 Analysts Now Maintain that Gold is Going to $5,500 – $6,500/ozt. in 2015! 5. Is Gold About to Go Parabolic to $3,495 in June ’13; $10,899 in Sept. ’14 and Top Out at $32,659 on Jan. 16, 2015? 7. Gold Bugs: Here’s How to Make the Most of the Continuing Bull Market in Gold! Next Nasdaq 100 Dropped 80% Last Time Penny Stock Volume Was So High – Will it be different this time?